Ezzells – Located in Seattle this is the best fried chicken that I have found in the short time that I’ve lived here. If you go, get the original and spicy mixed. Look if it is good enough for Oprah, then it is good enough for you. Babe’s Chicken Dinner House- locations throughout Texas. The chicken and biscuits are amazing. I would be happier if they offered better sides. 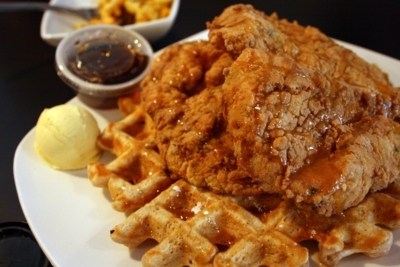 Dame’s Chicken & Waffles – They have 2 locations one in Durham and a new one in Cary, NC. Y’all I don’t know what the secret seasoning is but I believe it was invented by a saint. Don’t pass on the waffles either. Bojangles – If you follow me on Instagram, then you know about my love for the Bo. Seriously, as soon as I land at the RDU airport I go immediately to Bojangles. Yes, this is a fast food chain. But my goodness it is so good. And one does not tailgate in NC without a box of Bojangles. Try some of this cajun goodness the next time you’re in the Southeast. What is your favorite place to grab fried chicken? I’d love to have new places to try. Previous: Previous post: Outlaw Tamales has rolled in! How did I miss this as a National Holiday! !